You have made a financial commitment to your health and wellbeing. Attend all scheduled sessions to ensure you are getting the most out of your payment. Scheduling of sessions will be the sole responsibility of the client. TNT will not be responsible for a client’s failure to schedule their own sessions. You will not be reimbursed for sessions you fail to schedule. 24 hours notice must be given by a client in order to reschedule the session, otherwise the client will lose that session. Unused sessions will expire at the end of the Calendar Month. 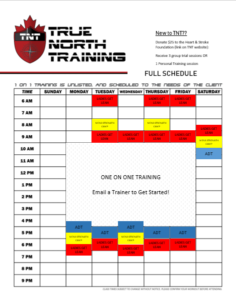 In the event that a TNT trainer/coach is unable to make a scheduled session, the client will have the choice of being reimbursed or have it rescheduled. TNT Ten Session Packages expires 10 weeks from the date of initiation. Note – Discounts listed above are based upon all parties involved being fully enrolled clients. Referred clients must enroll into program of equal or greater value.